They revealed their talents in opera, singing and playing the guitar*, earning the warmest of applause and proving that the film festival, that is about to celebrate its 20th birthday next year, “breeds” a new generation of artists. Besides, the two Spanish hosts Iñaki Lamua and Marina Muñoz, whose Greek is by now almost exceptional, used to also be Zizania and now together with Dimitra Myftari, shared the stage of the Apollo theater for the opening ceremony! One of the most sentimental moments was when another “ex-Zizanio”, Panos Chatzilazaridis, who is now a grown man, beautifully sang to honor the Chairman of Ert (Greek national radio & television), Dionysis Tsaknis, who was present at the ceremony, one of the latter’s most famous songs: “I am turning my back to the future” (free translation). The lyric saying “You won’t have me as an accomplish to the murder”, shocked the audience. Moved and “agitated”, as Dionysis Tsaknis described himself, he wished for “the times to come to cancel the meaning of this song and the need of people to sing it”. He also confessed it feels peculiar to him to be sitting in the first row of “official guests” at the theater, as he would always comment on them as a youngster sitting in the last row. Speaking with the warmest of words about the Festival, he emphasized how unbelievable it is to see “a whole city behaving totally different compared to the youth stereotypes shown by private television”. He also wondered “What is the role of national television? To identify with what is happening here! Congratulations to the youth! Congratulations to Dimitris Spyrou for painting this picture. The picture we want to represent Greece”. The Deputy Minister of Education, Mr Dimitris Baxevanakis, was also present at the opening ceremony and pointed out that “the state needs to actively support this globally irradiating organization” and that “the contribution of the students in its success is enormous”. An old friend of the Festival, archaeologist and General Secretary of the Ministry of Culture, Mrs Maria Vlazaki, remembered how last year, the Zizania asked her when she would institutionalize the Olympia Film Festival. “But you have already achieved that!”, she replied. “The festival is a cinema incubator. And don’t forget there are new EU financial support programs. We will be waiting for you, Mr Spyrou…”. “Greece is now in a strained position, while dark clouds are gathering over the whole Western World”, said the president of the Festival, Mr Georgiopoulos, thus declaring the beginning of the creative week to come. “Quite often, reactions to the hard times we are going through, take the wrong turn. And within these times, it is admirable how in the cities of Pyrgos and Amaliada, children learn to love art. And I am looking forward to seeing through their own films how they perceive the world crisis, take it and turn it into art”. 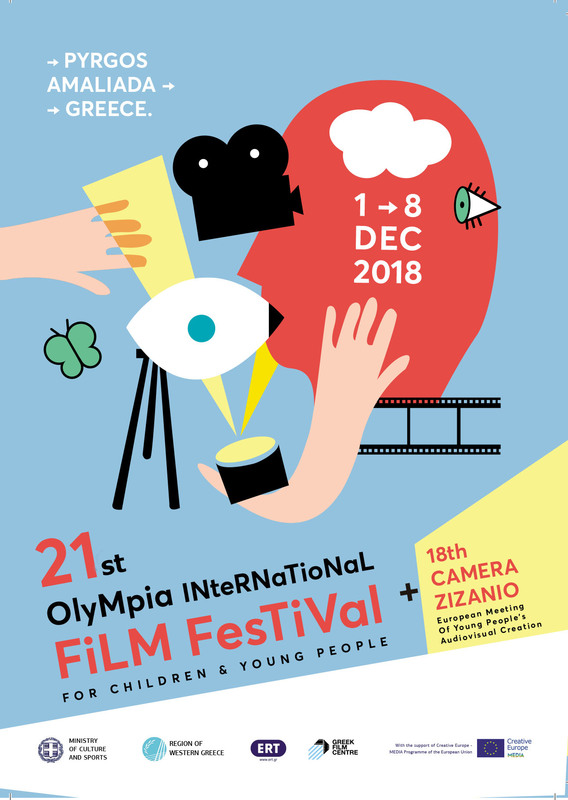 The artistic director, Mr Dimitris Spyrou, the “core” of the Olympia Film Festival, referring to the films from the whole world that he has chosen for this year, accentuated “no issue concerning our planet right now has been left out”. And further explained that “a children’s festival does not want the youth to passively consume pictures, but rather think, judge, cultivate their aesthetics and not just shallow whatever is served to them by people who use art as merchandise. A children’s festival aspires to contribute into its viewers becoming responsible citizens…”. He also happily noted that this year “all institutions unanimously decided to support the festival. And this is important. It’s important to give everything we can to the youth!”. Among others, the opening ceremony was attended by the Deputy Minister of Social Security, Mr Tasos Petropoulos, the Deputy of Ilia, Mrs Efi Georgopoulou Saltari, the Deputy of Evia, Mr Giorgos Akriotis, the Mayor of Ilida, Mr Christos Christodoulopoulos, the Deputy Head of Economics of the Western Greece Prefecture, Mr Panagiotis Bramos, the General Secretary of the Municipality of Pyrgos, Mr Charis Antypas (who gave his own greetings on behalf of the Mayor, Mr Gavrilis Liatsis, who could attend), the Deputy Mayor of Olympia, Mr Giorgos Devves, the assistant to the Head of the Western Greece Prefecture in matters of Volunteering and Olympism, Mr Dimitris Kostarias etc.